Last summer I had an internship with the Delaware River Mill Society: a historic site in Stockton, New Jersey. My main job was to serve as a docent – or in other words a glorified tour guide. While the complex had many historic buildings I spent most of my time in the Prall House, which was supposedly haunted.Since I had to memorize all sorts of historical trivia about the Prall House – which was over 200 years old – I was also familiar with all the items sold in the gift shop, since it was part of my job to work as the cashier. 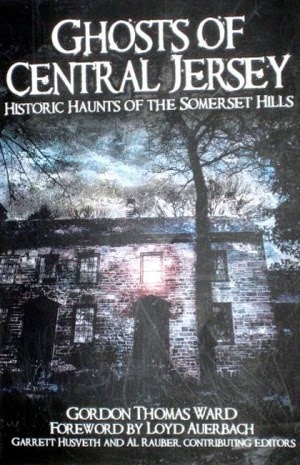 One of them was a book by Gordon Thomas Ward, titled “Ghosts of Central Jersey: Historic Haunts of the Somerset Hills”. Sounds pretty spooky, huh? The entire time I had worked in the Prall House I’d never experienced any of the above events. Wanting to experience these strange happenings ourselves another intern, David, and I decided to camp out in the Prall House overnight. Because everyone knows ghosts only come out at night. Since we both had keys to the building we snuck in after work one day, ready to give ourselves a scare. Besides the usual TAPS-esque “DID YOU HEAR THAT?” whispering at every pop and crackle the old house made as it settled we didn’t see nor hear any ghosts. We even tried the same thing that Ward had in his book; which was essentially provoking the spirits into answering us by asking the same questions over and over again. When we played back our recordings (admittedly done on a tape recorder and not an EVP-machine, if there’s even a difference) we didn’t hear anything out of the ordinary except our ridiculously nervous sounding voices and the silence of the Prall House answering. Okay, sounds a little sketchy to me. You can’t prove that ghosts exist but you can find evidence supporting their existence? However, there may be some credence to what Mr. Ward says after all. According to him, if a person doesn’t have enough ‘psychic ability’ paranormal phenomena will not occur in their presence. Ward also claims there are different types of paranormal events…not just the stereotypical disembodied voices and pale, translucent apparitions we associate with ghosts. Perhaps the combined ‘psychic ability’ of Haunted New Jersey was high enough that the ghosts went so far as to touch the paranormal investigators, as well as move stationary objects in their presence and stomp around upstairs to let them know they existed. If the words of Mr. Ward are to be taken completely as fact the only logical conclusion is that David and I did not have enough psychic ability and thus the spirits ignored us. Mr. Ward’s book, while most likely not entirely factual, does contain EVP recordings taken in the Prall House and other sites (which unfortunately I couldn’t find online) if you would like to hear them yourself. To the left is the Prall House, featured on the cover of Ward's book: Ghosts of Central Jersey: Historic Haunts of the Somerset Hills. While ordinarily charming and picturesque, with the heavy use of photoshop filters it appears sinister and haunted. Thats really cool you got to work in that building all summer! I have read and researched my fair share of "explanations" on what people think ghosts are or how they can prove their existence. I think for certain people who are not sensitive enough to see or feel a presence they can go throughout life without ever having an experience. I plan on posting about Ed and Lorraine Warren and a book I read called the Demonologist, they describe their explanation on good and evil, and how spirits form etc. Its an amazing read and really gives you in depth information on the subject.